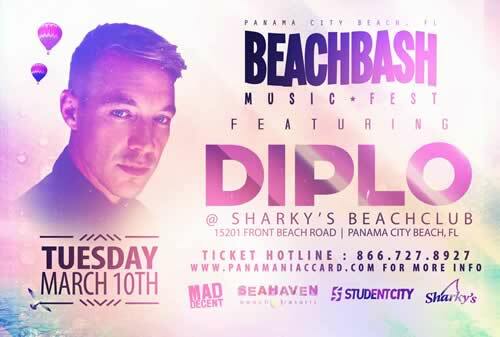 Home » Events » Diplo Performs LIVE at the Beach Bash Music Fest! Diplo Performs LIVE at the Beach Bash Music Fest! The Beach Bash Music Fest is proud to announce that on Tuesday March 10th at Sharky’s Beach Club DIPLO will perform on the main stage. The Beach Bash Music Fest is one of the premier events during Spring Break in Panama City Beach Florida and will once again be bringing in some of the best performers and DJ’s in the world. TO PURCHASE YOUR ADVANCE TICKETS TO THE BEACH BASH MUSIC FEST CLICK HERE!